In patients at risk of ‘silent’ cardiac ischaemia (e.g., with diabetes, severe coronary artery disease), the cardiologist and/or cardiac surgeon should be consulted before attempting objective assessment, and strong consideration should be given to ECG-monitoring throughout and after the assessment. The standard 6MWT or modified 6MWT assessment are two feasible options for the assessment of exercise capacity at hospital discharge. If a walk test has been performed prior to surgery, a repeat walk test at hospital discharge will provide information that can be used to benchmark early and relative recovery of exercise capacity and provide a baseline before commencing post-acute exercise rehabilitation. The presence of physiological factors that may reduce exercise capacity in the early post-operative period should be assessed and recorded. Post-surgical inpatient exercise of reasonable intensity can improve functional outcomes at discharge[#hirschhorn-ad-richards-d-mungovan-se-et-al.-2008,#van-der-peijl-id-vliet-vlieland-tpm-versteegh-mim-et-al.-2004]. Assuming that the patient is haemodynamically stable (and that there are no other contraindications), walking, sitting out of bed and gentle ambulation (on the spot or for short distances within a monitored environment) are suitable during the first 48 hours. All patients should undertake a progressive walking program during the inpatient stay. During this time, some patients may be prohibited from using walking aids due to concerns that weight-bearing through the upper limbs may affect sternal union and healing. Stationary cycling may provide an alternative mode of exercise for patients unable to walk independently without an aid, provided that the patient can easily mount and sit comfortably on the seat. One benefit of stationary cycling is that it may be easier to monitor the patient (ECG, blood pressure, etc. ), and hence constrain or stop exercise if necessary. For specific recommendations on thoracic and upper limb exercise during the post-operative phase, see sections on musculoskeletal management and sternal stability management. Following cardiac surgery, it is prudent to continue ECG monitoring with exercise during the early post surgical period, until otherwise confirmed by the cardiac surgeon or cardiologist [#drew-bj-califf-rm-funk-m-et-al.-2004]. AF occurs in approximately 30% of patients undergoing isolated CABG and approximately 60% of patients undergoing combined CABG and valve procedures. [#drew-bj-califf-rm-funk-m-et-al.-2004] The onset of AF most commonly occurs between the second and fourth post-operative day, so in many institutions, ECG monitoring (e.g., via telemetry) is continued for at least the first 4 days. Patients with AF, particularly with rapid ventricular response ( >100 beats per minute) are at risk of haemodynamic compromise during exercise. For these patients, exercise should be undertaken only when haemodynamically stable and should be limited to gentle walking, as tolerated. BP should be measured prior to mobilising and the patient monitored throughout for signs of hypotension, dizziness and fatigue. As ECG systems are often monitored at a central location (e.g., a nurse's station), it is useful to alert staff at this location when an exercise session is to be undertaken, so that the exercise session can be stopped in a timely fashion if a cardiac arrhythmia/event occurs. Intermittent or continuous SpO2 should be measured during exercise using a portable pulse oximeter. Supplemental oxygen should be strongly considered during exercise if resting oxygen saturation is below 92%, or if the SpO2 drops by 5% or more during exercise. Note that if a patient is in AF, it may be difficult to obtain an accurate SpO2 measure. Almost all patients experience respiratory dysfunction to varying degrees after cardiac surgery. Supplemental oxygen will often be needed during exercise in the first 48 to 72 hours. Prescribing exercise on the basis of HR alone is not recommended. This is because there is considerable individual variance in resting HR, as well as HR response to exercise in the acute setting. Furthermore, HR response is influenced by various medications, particularly beta blockers. Use of the Rating of Perceived Exertion- Borg scales is often more appropriate for monitoring and prescribing exercise intensity than HR in these patients. Most patients can resume physical activity and exercise within a few days of their PCI unless obvious problems are evident. The underlying IHD is the main influence on exercise prescription; see previous section on ischaemic heart disease. The patient's compliance with anti-platelet medications. Coronary artery bypass graft (CABG) is usually performed via surgical division of the sternum (i.e., median sternotomy). Post-operative complications include musculoskeletal problems related to the incisional scar (infection, hypersensitivity, hypertrophy) and sternal instability. Thorough assessment of these post-surgical factors is crucial to safe and effective exercise prescription. Following a median sternotomy, the two sternal halves are usually approximated together using stainless steel wires in order to restrict any movement between the two bony edges to optimise healing. Minimal motion of the two sternal halves should only be present in the early weeks following this procedure. There is no research regarding the length of time it takes for the sternum to heal. Therefore, it is important to correlate the findings from a subjective and physical examination and report any positive findings to the treating cardiac surgeon or general practitioner. Sternal instability is where there is excessive movement due to disruption of the wires connecting the surgically divided sternum. Lack of treatment can result in sternal pain, non-union and infection; factors which may delay the healing of the sternum. [#robicsek-f-fokin-a-cook-j-et-al.-2000,#el-ansary-d-waddington-g-adams-r.-measurement...2007] This process is shown in the figure below. Sternal instability is often reported as a ‘clicking/clunking’ sensation in the chest that results in pain and discomfort with activities of daily living (ADL) involving the upper limbs and trunk such as reaching, rolling over in bed and getting up out of a chair. As sternal non-union and the consequent inflammatory reaction may predispose to mediastinitis or deep sternal wound infection, early detection and management are essential. 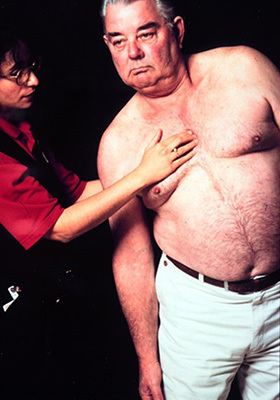 # Special testing may include shoulder flexion (unilateral/bilateral), trunk rotation, lateral flexion, coughing and opposing movements of the upper limb (e.g., flexion, abduction and external rotation of one upper limb accompanied by extension, adduction and internal rotation of the other upper limb). 2. To further challenge the sternum, an additional optional movement is contrary shoulder movement (i.e., one shoulder flexing and externally rotating, while the other shoulder extends and internally rotates). 3. During movement, record grade of motion, bony gap (size) and tenderness. Sternal precautions have historically been recommended for all patients who have undergone a median sternotomy in an attempt to avoid excessive shearing and distractive forces at the sternal edges, which would compromise the healing sternum. However, the evidence for this premise has been drawn from expert opinion, institutional protocols and studies on cadaver and replica models. There is significant variation in the clinical application of sternal precautions amongst institutions, with no consensus on the type and duration of time for which they are applied. [#balachandran-s-lee-a-royse-a-et-al.-2014] Recent studies have indicated that bilateral upper limb movements produce less movement and pain compared with unilateral upper limb elevation, whilst coughing increases movement and pain at the sternal edges. TIP: Base sternal precautions on an individual’s medical history/risk factors, assessment findings of sternal stability and/or response to exercise as outlined in the sternal precautions algorithm. Bilateral upper limb activity within patient comfort is advised. For those with established sternal instability, a return to theatre for surgical re-wiring is often necessary. At times, this option is not available if bone quality is poor or confounding risk factors for re-operation exist. Non-surgical approaches involve external bracing and exercises. All women should be encouraged to wear a supportive bra, with wide straps and no underwire, early in the post-operative period to ensure support of their breasts and minimise undue stress on the healing sternum and associated wound. 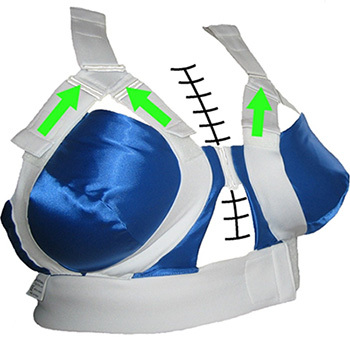 An example of a bra designed specifically for this patient population is the “Qualibra” shown below. Bilateral upper limb resistance training using weights and pulleys may commence on entry into the outpatient exercise program. Patients who have had a median sternotomy should be provided with education and Activity guidelines for the sternum following open heart surgery outlining current recommendations for daily activities. These recommendations are listed below. Sternal instability may be graded on a scale of 0-3 depending on the extent of bony disruption. [#el-ansary-d-waddington-g-adams-r.-trunk...-2007] The table below lists recommendations for the management of patients with sternal instability. Following surgery, movement of the cervical and thoracic spine and shoulders may be reduced in the early post-operative phase. Joint range of motion should be assessed before surgery and throughout the acute post-operative (in hospital) and the post-discharge phases of rehabilitation. In addition to a walking program, patients should commence thoracic, neck and upper limb exercises whilst in hospital. Examples of patient resources for cervical spine, trunk, and upper limb mobility exercises are provided below. Local protocols established according to current evidence should be adhered to. Patients are often advised to limit upper limb activity following surgery involving a median sternotomy. Protocols vary significantly according to institution and are largely based upon historical guidelines, expert opinion and cadaver studies. Refer to sternal stability management for more detail. Implantation of ventricular assist devices (VADs) increase circulating blood flow and allow the patient to undertake exercise at a higher intensity. Maximal intensity, however, is sometimes limited by the device itself. Clinicians prescribing exercise should therefore have a thorough understanding of the physiology imposed by different devices. VADs having a system of alarms, some of which require urgent attention. The exercise supervisor should be familiar with their implications for exercise. VAD parameters should be recorded before and after each exercise session and any alarms that are triggered should be documented. In some circumstances, the VAD settings may require alteration, necessitating close liaison with the VAD nurse. Exercise training is essential to optimise functional ability and fitness prior to transplant surgery, and to accelerate recovery in the post-operative phase. The pre-transplant phase may require shorter duration activities and greater rest periods. Exercise training also helps offset the effects of immunosuppressive medication (muscle atrophy, bone demineralisation, increased adiposity) and assists return to routine life following transplantation. Patients need to contend with post-surgical complications, episodes of cardiac transplant rejection, altered physiology (cardiac denervation) and infection risk, so exercise should be prescribed and progressed according to individual circumstances and clinical presentation, to enhance continued and prolonged adherence. Hoggins TR. Physiotherapy after open heart surgery: a randomized control trial [Masters of physiotherapy thesis]. Parkville, Vic. The University of Melbourne. 2009. Hirschhorn AD. Coronary artery bypass graft surgery: Exercise testing and prescription in the acute perioperative phase. (PhD thesis, Griffith University, Gold Coast, Australia). 2010. Brooks D, Parsons J, Tran D, et al. The two-minute walk test as a measure of functional capacity in cardiac surgery patients. Arch Phys Med Rehabil 2004;85:1525-1530. Hirschhorn AD, Richards D, Mungovan SE, et al. Supervised moderate intensity exercise improves distance walked at hospital discharge following coronary artery bypass graft surgery - A randomised controlled trial. Heart Lung Circ 2008;17:129-138. Van der Peijl ID, Vliet Vlieland TPM, Versteegh MIM, et al. Exercise therapy after coronary artery bypass graft surgery: a randomized comparison of a high and low frequency exercise therapy program. Ann Thorac Surg 2004;77:1535-1541. Drew BJ, Califf RM, Funk M, et al. Practice standards for electrocardiographic monitoring in hospital settings: an American Heart Association Scientific Statement from the Councils on Cardiovascular Nursing, Clinical Cardiology, and Cardiovascular Disease in the Young: endorsed by the International Society of Computerized Electrocardiology and the American Association of Critical-Care Nurses. Circulation 2004;110:2721-2746. Robicsek F, Fokin A, Cook J, et al. Sternal instability after midline sternotomy. Thorac Cardiovasc Surg 2000;48:1-8. El-Ansary D, Waddington G, Adams R. Measurement of non-physiological movement in sternal instability by ultrasound. Ann Thorac Surg 2007;83:1513-1517. 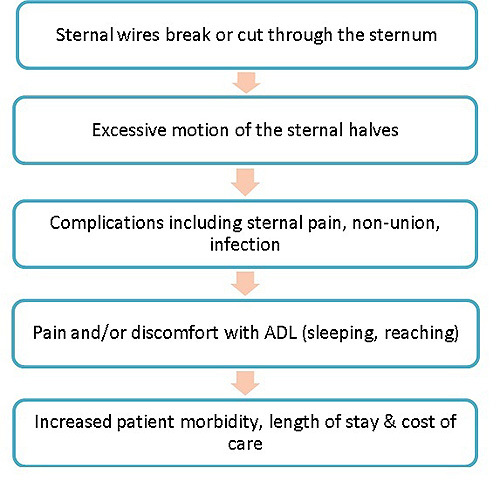 El-Ansary D, Waddington G, Adams R. Relationship between pain and upper limb movement in patients with chronic sternal instability following cardiac surgery. Physiother Theory Pract 2007;23:273-280. Balachandran S, Lee A, Royse A, et al. Upper limb exercise prescription following cardiac surgery via median sternotomy: a web survey. J Cardiopulm Rehabil Prev 2014;34:390-395. 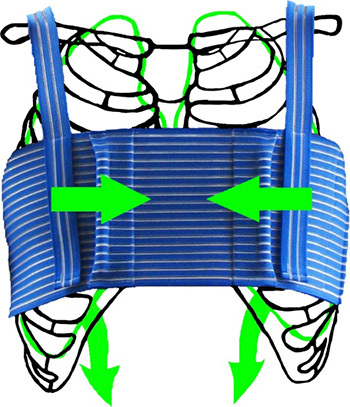 El-Ansary D, Waddington G, Adams R. Control of non-physiological movement in sternal instability by 23.supportive devices: a comparison of a fastening brace, compressive garment and sports tape. Arch Phys Med Rehabil 2008;89:1775-1781. El-Ansary D1, Waddington G, Adams R. Control of separation in sternal instability by supportive devices: a comparison of a fastening brace, compressive garment and sports tape. Arch Phys Med Rehabil 2008;89:1775-1781. El-Ansary D, Waddington G, Adams, R. Trunk stabilisation exercises reduce sternal separation in chronic sternal instability after cardiac surgery: a randomised cross-over trial. Aust J Physiother 2007;53:255-260.